This weekend, we have a round of rescheduled National League fixtures following postponements from earlier in the campaign and all 13 matches across the three divisions are significant as we approach the final two months of the season. ‘A real team effort’ is how Ampthill and District head coach Paul Turner described his side’s win over Bishop’s Stortford last weekend. The A’s secured a potentially crucial bonus-point victory at Dillingham Park and for the second match in a row, it was far from straightforward for Ampthill. Nevertheless, a team fighting for the title needs to grind out wins and the Bedfordshire outfit have picked up five victories on the spin as they head into their key game in hand against Caldy this weekend. The second-placed side are five points behind current league leaders Old Elthamians, who aren’t in action on Saturday, so there is a massive incentive for Ampthill. There is also motivation for Caldy as the Wirral side conclude February seven points clear of the bottom three. The men from Paton Fields lost to promotion chasing Blackheath last time out, but it was another encouraging performance from Caldy, especially on the road. Caldy did beat Ampthill 19-18 back in October and a similar result would nudge them further away from danger. After narrow defeats against Old Elthamians and Darlington Mowden Park back in January, Rosslyn Park haven’t put a foot wrong. Three consecutive victories has kept them firmly in the title race and their latest win away at Loughborough Students means Kieran Power’s side head into Saturday in fourth place and nine points off the top. It was a try-fest when Park went back to uni! Park have put in the hard work to stay in the hunt and now they must deliver once again if they are to keep the pressure on league leaders OEs. The men from the Rock travel to the Midlands for the second weekend running and this time, they take on a Birmingham Moseley side who currently sit in the bottom three. A 37-30 loss to rivals Sale FC in Round 23 means Richard Protherough’s men are now seven points adrift of safety after a run of five matches without a win. For both teams, this is a pivotal game in their respective campaigns, but who will come out on top at Billesley Common? When this fixture was originally scheduled at the start of the month, Rotherham Titans and Chinnor were still in the promotion conversation. Fast-forward to the end of February and the title hopes of both clubs have all but faded away. In terms of Rotherham, three defeats from their last four games has scuppered their chances of an immediate return to the Championship and the Titans currently sit in fifth place; 21 points behind table toppers Old Elthamians. As for Chinnor, four losses on the trot has seen them slip down to eighth in the table and Matt Williams’ side will be keen to return to winning ways as they look to end their season strongly. In fairness, the Oxfordshire club have had a very solid debut campaign in National One and a first home victory since the opening weekend of 2019 would provide a welcome boost at Kingsey Road on Saturday. It really has been a season of two halves for Darlington Mowden Park. Before Christmas, Danny Brown’s side struggled for consistency and their patchy form meant the North-East outfit were cemented in mid-table. However, since the start of 2019, DMP have been a completely different proposition and they travel to Sale FC this weekend in fine fettle. Mowden Park have lost just one of their last six games and, unsurprisingly, their recent form has lifted them up to sixth place in the table. However, they will have to be wary of their hosts on Saturday as Sale come into this rescheduled fixture with confidence behind them as well. Jonathan Keep’s men picked up a vital victory over Birmingham Moseley in Round 23 and Sale are now nine points clear of the drop zone. The Manchester-based club have won their last three matches at home and they may fancy their chances of extending their run as February draws to a close. It wasn’t a rip-roaring performance from Hull Ionians in Round 23, but I bet Martyn Wood’s side didn’t care last weekend. Following three straight defeats which had knocked them off the summit of National Two North, the I’s returned to the top of the division after beating rivals Fylde at Brantingham Park. The Yorkshire outfit are back in pole position by virtue of ‘Games Won’ and with eight matches to go in their season, they will not want to let it slip again. Hull have now racked up 26 successive home wins over the course of two terms in National Two North so the task facing South Leicester will be a difficult one on Saturday. The bigger picture for the Midlands club is also becoming increasingly tough as last week’s defeat to Wharfedale leaves South 11 points from safety as things stand. Just two wins from their last 10 games doesn’t read well for the men from Welford Road, but you can guarantee the visitors will be out to cause an upset this weekend. 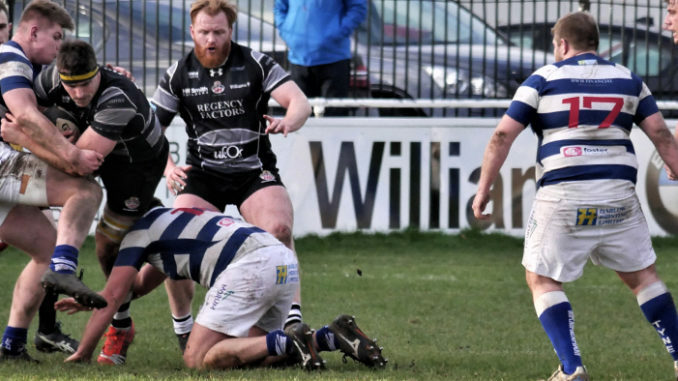 Chester’s victory over Hull Ionians in Round 22 boosted their promotion ambitions, but their excellent result was nearly undone last weekend. Jan van Deventer’s side had to come from behind to rescue a draw against Stourbridge and now the men from Hare Lane are level on points with the I’s, heading into this weekend. In truth, the aforementioned draw in the Midlands may well be a defining result in the season for Chester and they will look to keep the pressure on the league leaders when they visit Hinckley on Saturday. Prior to last weekend, the Hornets had not lost at home for 11 months, but a narrow defeat against promotion chasing Huddersfield led to another disappointing result for George Chuter’s side. Their inconsistent form this term has held them back from challenging for a top two position, but the Midlands club can have a say in the promotion race if they were to return to winning ways on the weekend. The announcement of his new contract followed by a seventh straight win for his side rounded off a very positive week for Huddersfield head coach Gareth Lewis. The Yorkshire outfit continued their fine form to move to within one point of leaders Hull Ionians and with an extra game in hand on the teams above them, the ball is very much in Huddersfield’s court. Their first opportunity to edge closer to the top two comes at home against Wharfedale, but the visitors to Lockwood Park are also going through a purple patch. Rob Baldwin and Jon Feeley’s side have strung together a run of four straight wins and Dale are now 10th in the table. A victory this weekend could lift them to the cusp of the top six if other results also go their way so Wharfedale may well pose a serious threat to Huddersfield’s promotion ambitions. Tynedale’s wonderful 2019 continued in Round 23 as they were able to hold off a spirited comeback from Otley to secure their fifth win from their last six matches. After a slow start to the season, Ben Woods and his side have really turned their fortunes around over the last two months and Tyne can move into the top six with a victory this weekend. The North-East side have also won their last seven matches at home, which is a stat Peterborough Lions do not want to read or hear. The visitors to Corbridge on Saturday are currently rooted to the foot of the table and the Lions are 25 points from safety with eight games in their season remaining. An immediate relegation to Midlands Premier does look inevitable, but can the men from Bretton Woods give themselves the slimmest of survival chances by claiming their first away win of the campaign? Sedgley Park produced a reaction from their home defeat against Tynedale in Round 22 as they came away from Peterborough Lions with all five points last weekend. A lot has been made of Sedge’s patchy form this term, but the eighth-placed side concluded February having won three of their last five matches. Matt Bebbington’s men will only be focused on finishing this campaign in a positive fashion while Sheffield Tigers know there is still some work left to do if they are to secure their status in National Two North for another season. Jamie Broadley’s side sit 11 points clear of the bottom three following one win from their last seven games and the Tigers were once again on the wrong end of a narrow scoreline against Preston Grasshoppers last Saturday. The Yorkshire side still have clear water between themselves and the relegation places and if they can claim a first win for over two months on Saturday, it would push them away from the trapdoor. As we approach the final two months of this season, Preston Grasshoppers may well be giving themselves a deserved pat on the back. Paul Arnold’s side gained promotion to this level last April and the Lancashire outfit have very rarely been dragged into a relegation scrap on their return to National Two North. Yes, Hoppers had a slow start, but since then, they have been untroubled and will arrive in Cheshire on Saturday having won three of their last four matches. Preston are on the edge of the top eight while their hosts Macclesfield are falling towards the fifth tier. The Blues currently sit 20 points from safety following a run of seven straight defeats. The problem for Macc has been putting together an 80-minute performance and it is something they have got to put right sooner rather than later if they are to pull off a remarkable escape. Can they muster up a victory at Priory Park on Saturday? It is arguably the game of the weekend across the National Leagues as two of the play-off contenders collide on Sunday when Henley Hawks take on Taunton Titans. The visitors to Dry Leas currently occupy fourth spot in the division and successive narrow wins have maintained the momentum generated by Tony Yapp’s side over the last couple of months. Taunton have won nine of their last 10 matches and the Somerset club currently sit seven points behind second placed Canterbury. With this being Taunton’s game in hand over Canterbury, they can reduce that gap this weekend, but Henley will also be out to enhance their play-off hopes. The Hawks are one position and one point behind Taunton heading into this huge clash and Nigel Dudding’s side have put together a run of four straight wins since the middle of January. Defeat for either team on Sunday would seriously dent their promotion hopes and with two months remaining in the season, this fixture could prove decisive. 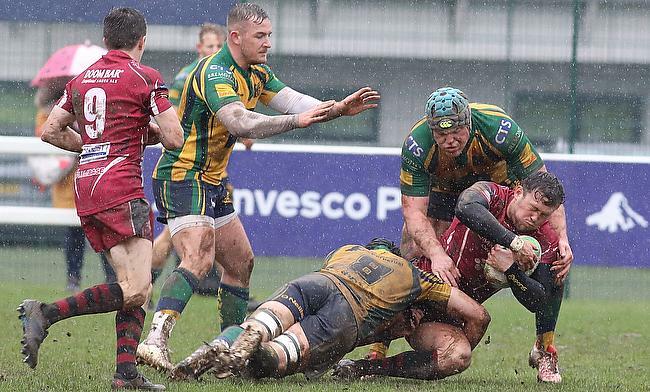 It certainly wasn’t pretty, but Clifton came away from London Irish Wild Geese with a bonus-point victory as they returned to winning ways in Round 23. Back to back defeats against Guernsey and Canterbury had just halted the Lavender and Blacks’ progress, but Matt Salter’s side will now be aiming to kick on to try and finish in the top eight this term. As things stand, Clifton do sit in eighth place while their hosts this weekend, Birmingham and Solihull, are in a much more precarious position. The Bees are in the bottom three and 15 points from safety so this game in hand with Clifton could be crucial if they are to evade an immediate relegation to Midlands Premier. One positive for Pete Glackin’s side to carry into this weekend is that they have won their last three homes games and a fourth consecutive triumph at Portway would keep their survival hopes alive. With eight games remaining in their season, it is all change for Old Albanian. Gavin Hogg parted ways with the club after last weekend’s draw with Worthing Raiders to take up an opportunity with Ulster Rugby and OAs brought in James Buckland as their new head coach. Buckland’s name may standout to some viewers of the Championship as he was in charge at Ealing Trialfinders for one game at the start of the campaign before he was bizarrely sacked by the club. Now, the latest chapter in his career takes him to Woollams and he will be hoping to get OAs firing again this weekend when they host Dings Crusaders. Old Albanian are without a win in eight matches so Luke Arscott’s side will arrive in Hertfordshire hoping to capitalise on that, but also return to winning ways themselves. Dings were beaten by Barnes last week and the Crusaders will know two or three more victories could be enough to secure their place in National Two South for another season. The Bristol-based side haven’t won away from home since the end of November so a triumph on their travels would be most welcome for Dings.